ABC didn’t sleep very well last night and I was helping out. We looked together at the moonlight casting shadows on the snow in the backyard. We are experiencing a super moon, meaning that the moon is at its closest to the earth in its orbit, so the moon appears a bit larger. By the time ABC went to sleep, the lunar eclipse was about halfway to totality. It was too cold for B and me to go out in the yard to observe it, but we could see it from our large, south-facing kitchen windows. Even though it was called the “super blood wolf moon eclipse”, in our area the eclipsed moon seemed more greenish-white than red, probably due to our atmospheric conditions. During totality, ABC woke up, so I was in her room for quite a while. By the time I could look out the kitchen windows again, the bright light of the moon was back, casting moonshadows from our trees on the snow. I got an early start on jotting today. I had tried to follow the advice from medical professionals and magazines to get to sleep relatively quickly, but no. I did, however, have a poem coalescing in my head, so I got up to write the draft down before I lost it. Midnight found me just finishing the draft. Of course, I can’t share the draft. It needs work and it is one that is meant to make its way into my manuscript, so I want to be careful about how and where it is published. Most publishers count blog posts, even in a wee, little blog like Top of JC’s Mind, as prior publication and they won’t publish anything that has already been made public. 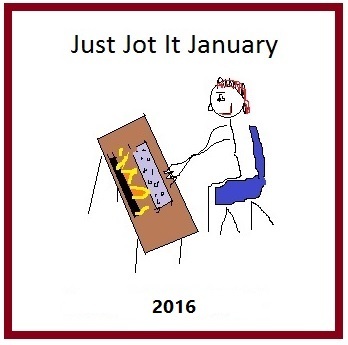 It isn’t too late to join Just Jot It January! Any jot will do and there is a prompt for each day if that is what helps you to get a post out. You don’t have to post every day, either. 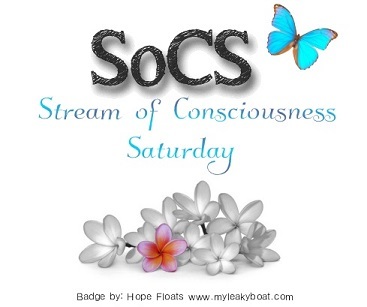 Just link to the post on Linda’s blog for that day to increase your blogging community and find new blogs to read. Enjoy! Since my mother-in-law died unexpectedly this spring, I have been having a real problem with lack of concentration. I find myself starting something, having something else pop into my head that I need to attend to, hopping over to that – and maybe something else – or two somethings else – before getting back to what I was doing in the first place. I realize part of it is the result of my seeming inability to sleep consistently. And the fact that there is just a lot to do on a lot of different fronts. I think part of it, though, is that it is genuinely harder to concentrate for extended periods of time. I find myself playing mindless games on the computer while the television is on in the evening. Often, the television isn’t demanding too much concentration in and of itself. I used to use part of evening TV time to visit and comment on other blogs, but I can’t seem to do it anymore. It takes too much concentration. Have I mentioned that I’m having a problem with concentration lately? For months, I have been wearing a Fitbit Flex fitness tracker. I am not obsessed with it. I do keep track of my step goal, which is modest so as not to be too daunting. It does point out that my sleep really is a pathetic as it seems. A few days ago, though, I had to take a break from wearing it. My wrist broke out in a rash from the band and I needed to let it heal. Fortunately, I was able to find a stretchy cloth bracelet to put my tracker in, which is much more comfortable to wear. Unfortunately, it is hot pink, which is not a favorite color of mine. Since December 17, I haven’t been at home alone. The combination of different family members on vacation from work, on semester break, and visiting from afar has meant that my usual pattern of spending most of the day Monday through Friday alone has not been in evidence. I don’t want people to think that I am a hermit. 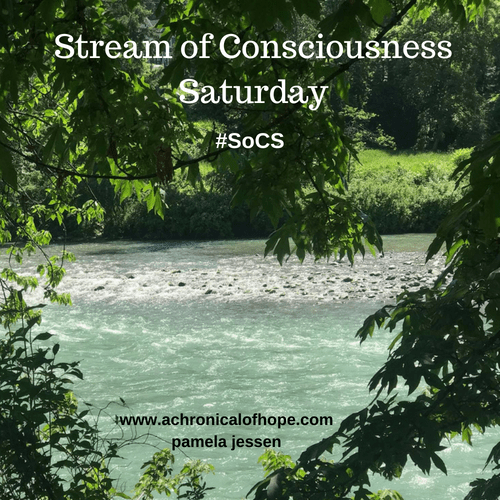 I am often out on errands, visiting people, or volunteering, but I am able to have solitude and time to read, correspond, and write on my own schedule. Yesterday, B headed out on a business trip. Today, I brought T back to Syracuse. The new semester begins tomorrow. I do have commitments on my calendar, but I hope to spend a lot of time catching up on writing, both for my blog and my poetry projects. I’m also hoping to get at least one poetry submission sent this week. While I am waiting for a response on a few submissions, all of my acceptances have now been published, so it would be helpful to get some more work in the pipeline. I am hoping to minimize time spent on cooking and other chores. Tonight, I had avocado sushi for supper and I already have heat and eat food ready for tomorrow. I wish I could say that I would be productive in the evening, but it is unlikely to be the case. I don’t tend to sleep well even when someone is in the house; being here alone is likely to mean even less sleep. I do hope to get enough sleep to have energy to accomplish things during the day.